Happy New Year! 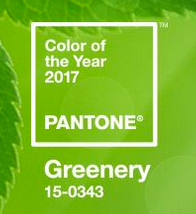 Each year Pantone, LLC, the foremost authority on color, announces a color of the year and 2017 is the year of Greenery! In an effort to create a standard in the graphic arts community where color matching and communication needed to be effortless, the PANTONE system was created and it's now used in hundreds of industries from graphic arts to fashion to home design. You'll start seeing a lot of this color this year, how about also adding it to your plate, effortlessly of course!